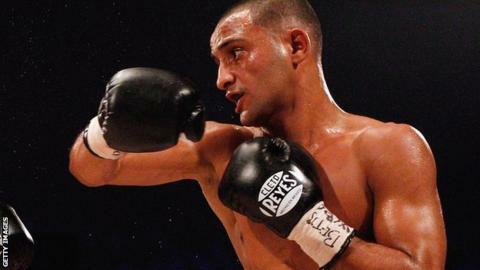 Kid Galahad won the vacant Commonwealth super-bantamweight title with a comfortable victory over Australia's Fred Mundraby in Sheffield. Home fighter Galahad, already the European title-holder, had too much class for his rival, who was retired by his corner after four one-sided rounds. In Liverpool, Derry Mathews regained the British lightweight title with a split decision over Martin Gethin. Mathews, 30, will fight Manchester's Terry Flanagan next on 25 July. Flanagan, who is unbeaten in 24 pro fights, stopped Bulgaria's Yordan Vasilev in two rounds on the same bill. Also in Liverpool, Chris Eubank Jr made it 15 wins out of 15 as a professional with a one-sided victory over Poland's Robert Swierzbinski. Eubank Jr, 24, had the limited Swierzbinski down seven times before the referee finally stopped the fight in the seventh round. And home favourite and former Olympian Tom Stalker continued his education with a points victory over Ryan Hardy, making it eight wins in a row since joining the paid ranks last year.